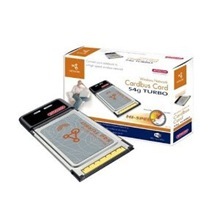 Using the 54g Turbo PC Card you can connect your Notebook to any Wireless home network, enabling you to share files and peripherals with other wireless PCs or Notebooks. If you have a Wireless Router and a broadband internet connection, the PC Card enables you to surf the web Wirelessly. Between Turbo adapters and Routers a Wireless transfer speed of up to 35Mbps can be reached. This makes the 54g Turbo range perfectly suitable for sharing heavy Multimedia files, like digital movies and music, ensuring maximal performance and benefits from your Wireless Network and your Broadband internet connection! The 54g Turbo standard adapter is compatible with both the 802.11b and the 802.11g standards.